External users can be assigned as a representative/approver for projects associated with the client. Client approvers can approve timesheets in which time is entered against the client’s projects (client approver sees only the lines containing their projects). Enter external user personal information in“Personal Information Section”. Select client whose representative/approver is this external employee. Click on[Add]to add this external user in OfficeTimer system. In[External User List], click on[Delete]link of record which you want to delete. In[External Users List], click on[Edit]link of record which you want to modify. 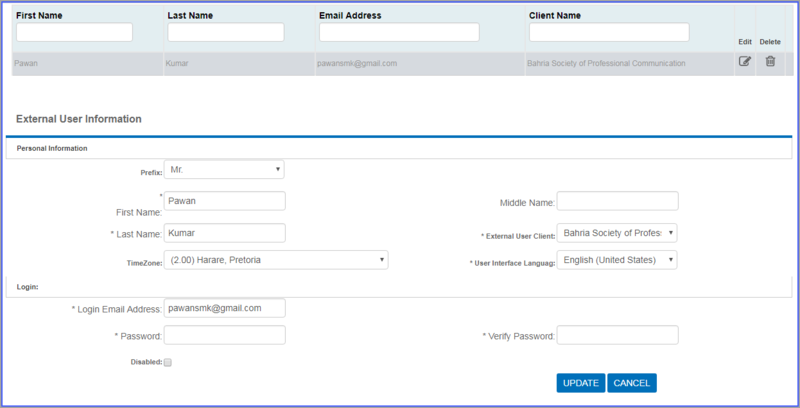 Update your required modification in[External User Information]form.